Kripa Panchagnula was presented with the 2017 Young Player of the Year award at the Summer Festival yesterday. 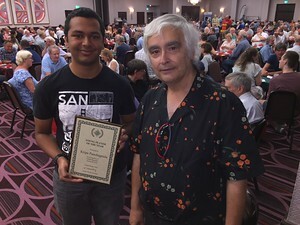 Congratulations to Kripa for a great year in which he was a key member of the U21 team which earned a bronze medal at the European Championships, won the Peggy Bayer Trophy, and finished second in the Channel Trophy competition. He is pictured receiving the award from EBU Chairman, Jeremy Dhondy. Other awards - including the Young Pair of the Year - will be announced and presented later in the year.